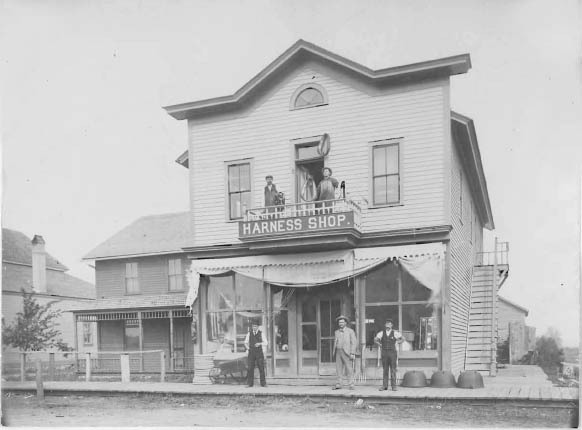 In 1899, Martin Loso opened the doors to his General Store and Harness Shop at 25 Minnesota Street. He wanted to keep business local and support local farmers—a philosophy that has carried on through his descendants (who managed the shop until 2010) and now through the new Minnesota Street Market Food and Art Co-Op. It all comes back to community members helping community members. William Bell Mitchell, in 1915, wrote of Martin Loso in his book, History of Stearns County, “He has a large establishment and carries a good stock, well suited to the needs of his growing list of customers.” Today, the Minnesota Street Market is reliving his dream; a vast array of organic, locally grown produce, thrift items and local art—good stock, well suited to the needs of its growing list of customers. In the late 1800s and early 1900s, the building at 25 Minnesota Street consisted of only what is now Closet to Closet, previously Loso’s Other Side. 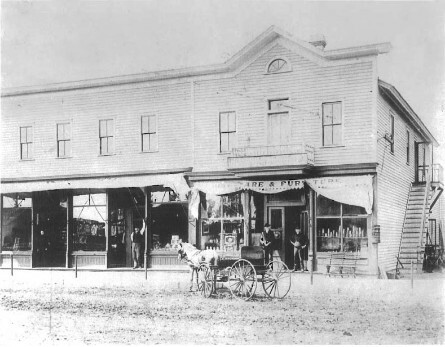 The lower portion of the building was the General Store, with The Harness Shop on the upper level. There was also a house attached to the business. Loso was quickly able to establish his inventory, complete with everything from shoes to hardware to food—including apples, syrup and barrels of molasses. His shop, plus two other grocery stores, thrived in this small-town atmosphere for many years. And in 1910, Loso even added on, building a newer and bigger wing at 27 Minnesota Street (now the Food and Art Co-Op) to help grow his business and spread out his inventory. You’ll notice in the photo above, there was a house attached to the building; this house was moved to another part of town, added on, and is still standing at 123 1st Ave NW. In 1930, Walter, Art and (wife) Helen Loso took on their father’s work. After Walter passed away in 1956, Art and, ultimately, Helen kept it going until 1980 when Richard Loso carried it forward. In 2010, over 110 years after they were opened, Loso’s regrettably closed its doors. Many of our St. Joseph community members were here through the years to witness the turnovers of 25 and 27 Minnesota Street and were saddened by the closing of Loso’s Grocery Store, a long-standing, trusted staple in town. For them, the Minnesota Street Market Food and Art Co-Op re-creates that feeling of small-town grocery and community spirit. Keeping with the tradition started so many years ago at these addresses, the Minnesota Street Market carries on its legacy—local, organic and community-oriented. Information provided by the St. Joseph Historical Society and its contributors.